If you are the parent of a child with autism, you might be very busy with managing the here and now. We spend a lot of mental energy looking for and maintaining services like daycare, education, and therapy. Thinking about your child’s life as an independent adult might seem far away…or it might be something you worry about. Last week, a friend and I attended a conference exploring the meaning of a good life, and how people with intellectual and developmental disabilities can have one. The conference was called The Family Gathering. The point was for families of people with disabilities to learn from one another, and most of all, from people who live with a disability. To that end, People First Manitoba were important participants. Relationships are the foundation of a good life. Through story after story, we heard real life examples of how the building of relationships provided an opportunity for people to enjoy life and make contributions that are meaningful for them. We heard from People First members, who talked about how hard it can be to speak up about what they want out of life, and how rewarding it is to set goals and achieve them. The sister of a senior citizen with a developmental disability talked about finding community activities that her sister enjoys – and that even though she is nonverbal, she is very effective at making her wishes known and building friendships with people. We heard about a young, nonverbal man with cerebral palsy who enjoys hosting regular family gatherings and stays in touch with friends via Facebook. And we heard about the life of another young lady with cerebral palsy, sharing the benefits of having a group of friends willing to advocate for inclusive education, freedom of mobility and independent living that most of us take for granted. Each story was different, and the networks of people around each was different. But what they all had in common was a strong support network beyond the immediate family. A support network is different from a social network. Both are really important. A healthy social network is made up of friends, family, people who provide services, people we offer services to, and romantic partners. A support network is a group of people who care about a person, and have indicated that they are willing to act purposefully to help them achieve their goals and make sure they have a healthy social network. Social networks add richness and purpose to our lives, and keep us safe. Parents need to plan ahead. The way services are delivered in most places, it’s easy for people who need support to be isolated. It’s hard for all families to take care of their children single-handedly. 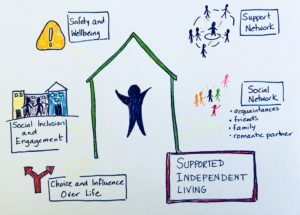 Each of the families who shared at the conference were purposeful about creating support networks for their children so that their children can continue to live good lives whether they are there or not. Maybe your child is still young – maybe they are already adults. Is it too soon or too late to begin planning and creating a support network? No! The goal and the journey are the same – we want to help our children explore their interests, build social connections, and develop capacity, no matter what their age. It’s never too late to start. Everyone – regardless of ability – can live a life of joy, curiosity, and connection. Those who shared their lives at the Family Gathering had a range of abilities. Most, in fact, were nonverbal, but were definitely able to communicate, explore their community, and to be understood by anyone willing to get to know them. 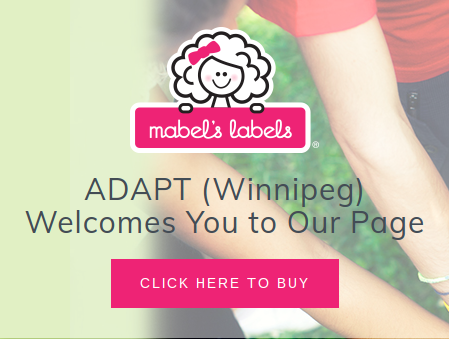 Community Living Manitoba, Inclusion Winnipeg, Continuity Care and Innovative Life Options are prepared to walk you through steps towards creating a support network for a person with a disability. To learn about the Government of Manitoba’s Building on Abilities support service for adults with intellectual and developmental disabilities, Community Living Manitoba is offering a video series. Part 1 and Part 2 are complete, Part 3 is coming soon. The plan is to hold a Family Gathering conference annually. Keep an eye out for the next one! Check out the documents on David Pitonyak’s imagine website for ideas about how to build support networks through the life span. Many thanks to the people at Community Living Manitoba, Continuity Care, People First Manitoba and Innovative Life Options for the time and effort it took to make this conference available!